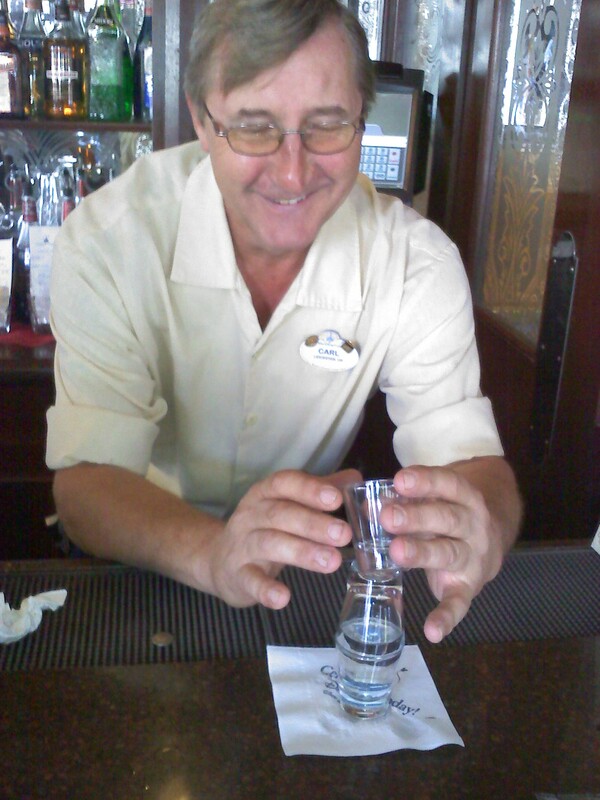 I have certainly made a habit of visiting the Rose and Crown inside Epcot, and I have also made a habit of talking on this blog about the pub’s iconic bartender Carl. A few weeks ago I once again spent some quality time in this great pub, chatting with Carl and watching as this master barkeep held court. Carl is known for not only being at the top of his nobel profession, but he is also a friend and a welcoming site for many a weary traveller. He is perhaps best known for his bar-tricks, the “Leaning Pint of Guinness” chief among them. But once again, he had myself and my fellow patrons scratching our heads trying to figure out one of his liquid riddles. Now the tricks are great fun, and watching a customer try and figure it out is always entertaining. 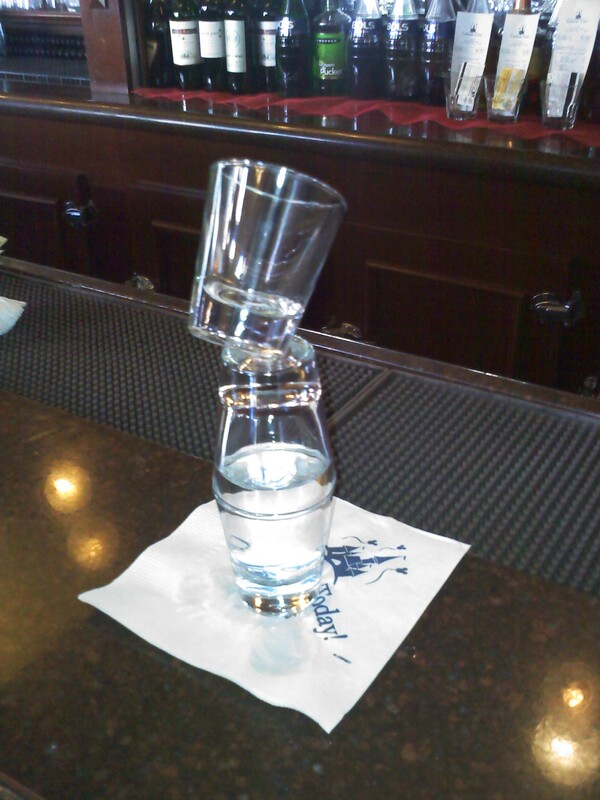 But like any great bartender, Carl is about much more than glass tricks. In a pub where there seems to be new faces behind the bar every time you visit, Carl’s is the one exuberant and welcoming face that always makes you feel like you stepped into your local pub. He has that certain something that makes people smile and enjoy their time at a great tavern. I have been coming to Walt Disney World for decades and have come across literally hundreds of employees, which Disney calls Cast Members, and have had many great experiences. Disney is a company known across the world as the standard of excellence in customer service. And no one I have ever met there exemplifies that standard as much as Carl does. You are always made to feel welcome and part of the circle of friends that make up the Rose and Crown. Folks from across the world make their way into this pub on a regular basis and somehow Carl seems to pull them all together. He recently received Disney’s “Partners in Excellence” award, which is the highest honor a Cast Member can receive. To win you must be nominated by your peers and then go through a lengthy review process. It is not given out to a certain number of people every year. It is only awarded when the Disney brass feels they have a deserving Cast Member. Carl’s father recently passed away, and he said he dedicated his award to him. Carl’s face would light up with pride when he mentioned it to his regulars. And he should be proud. He deserves to be recognized for the over two decades of exemplary service he has put in for us weary and thirsty wonderers. As I was drinking at the bar on a hot Florida afternoon a woman walked in and said hello to Carl. She said to him, “This is always our first stop at Epcot!” I could certainly understand where she was coming from. We laughed about it a bit and Carl said to me, “I’m always amazed how many people come back to see me each year.” Don’t be my good man. It’s because you perform a noble job, and you do it as well as anyone I have come across. Those of us who love a good bar will all agree that a place can be beautiful and the drink delicious. But without people like Carl to make the experience great, it would be just another bar. And here’s a tip if you should ever make it to the Rose and Crown and meet Carl. While you are listening to one of his great stories, or trying to figure out the secret behind his bar tricks, ask him what he did for a living before he was behind the bar. You won’t believe him when he tells you. That is until he produces a picture of him, a great hat, and a really mean looking alligator! A few months ago I wrote about a terrific pub found in a place you probably wouldn’t expect to find a great tavern, Walt Disney World in Florida. But that is exactly where you find the Rose and Crown pub at the United Kingdom pavilion in Epcot. But that isn’t the only surprise you may find in that neck of what locals call “the Mouse”. 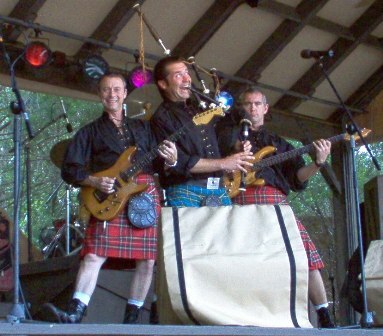 You’ll also find some seriously good Celtic flavored rock. As you walk out of the front doors of the Rose and Crown take a right and head towards the Canada pavilion. Just before you get there, you’ll see a stage on the right. Now take a look at the schedule the over-friendly person with permanent smile on his or hers face gave you when you walk in. If it says Off Kilter is going to play soon in Canada, take a seat and have a listen. You won’t be disappointed. Five days a week, and five time during those days, five men from everywhere but Canada play a unique blend of hard rock and Celtic folk at the Canadian Pavilion. Unlike Disney’s normal way of doing things, these guys may not fit the theme of their surroundings seamlessly. Like I said, none of them are actually from Canada and what they play is mostly not at all Canadian. But not a single employee I met that works in the Canada pavilion, all of them natives our northern neighbor, cares about that in the least. All they care about is that Off Kilter is good, very good. So have a seat, perhaps bring a pint with you, and be ready for a high energy performance form a band of virtuosos. 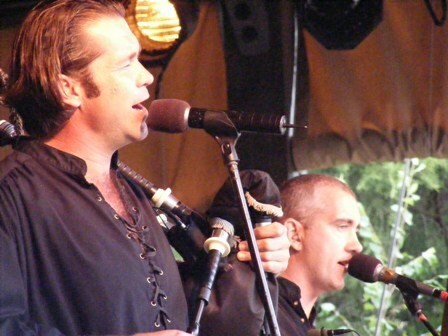 You’ll hear contemporary tunes, beautiful bagpipes melodies, and great traditional songs. And they are all done with a flair only Off Kilter can provide.